I have always from day one been a massive fan of Barry M. From their amazing eye liner and shadow collection to their amazing nail varnish. (my favourite item and has been for a long while is the Barry M Bold Waterproof Eyeliner!) & I found out about the awesome Ax Paris last year (didn't know they did a plus size range at first) and now I've fallen in love with them too so I just had to enter their comp! 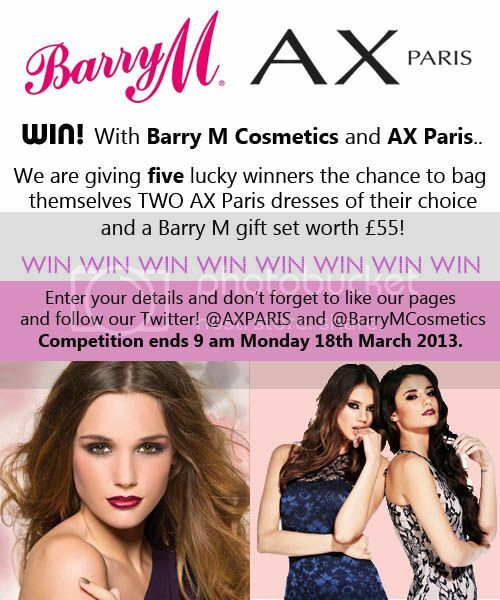 You can win not one but TWO of their beautiful dresses and Barry M cosmetics set worth a whopping £55. I really hope you can pick a dress from their plus size range if need be. I have already picked out two of the dresses I want. One of which has been on my wish list for a while now. Just waiting for this spending ban to finish. You can enter too.. CLICK HERE. The 2nd dress I know I've posted about recently. I love it. It's the Peplum Scuba & Lace Dress. (£40) I'm not sure what size I'd need though as I've never worn a peplum dress before but it's to die for. I love love love this dress!